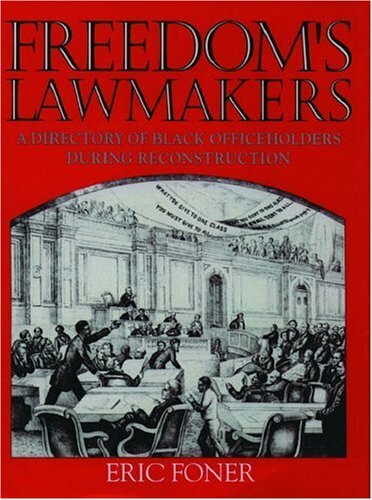 Freedom's Lawmakers is the first comprehensive directory of America's first generation of black public officials--those who held office during the Reconstruction era that followed the Civil War. With positions including congressman, justice of the peace, constable, and member of the legislature, the nearly 1500 officials listed here offer a panorama of the black community in all its diversity--freeborn and slave, Northern and Southern, rich and poor. The book draws on extensive research in the era's primary sources, and the voluminous literature on Reconstruction that has appeared in the past generation, providing information about the antebellum status, occupation, property ownership, military service, and other attributes of black officeholders. The concise biographies are augmented by 125 halftones, including seven composite photographs at the front of the book. In some cases, only a few pieces of information are available, but in a remarkable number of instances, the book traces the life histories of previously unknown individuals, most of them born as slaves, who played a role in America's first experiment in interracial democracy. The biographies follow many individuals into the twentieth century, illustrating the impact of these black Americans on post-Reconstruction society and the consequences for black Americans of the overthrow of Reconstruction.